Why we celebrating Easter? | Uwish - Wishes and Greetings for all Occasions. You are here: Home » Easter , Easter Facts , Happy Easter » Why we celebrating Easter? 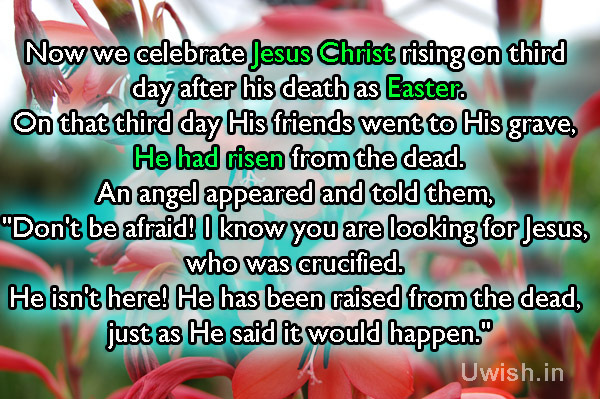 Now we celebrate Jesus Christ rising on third day after his death as Easter. On that third day His friends went to His grave, He had risen from the dead. "Don't be afraid! I Know you are looking for Jesus, who was crucified. just as he said, it would happen." Happy Easter, Easter quotes e greeting card and wishes. Images/Pictures of Happy Easter, Easter quotes e greeting card and wishes.